Maybe they had to wait for Kenny to not have a single on radio. It’s also on Reviver. They’ve been having success with Locash. 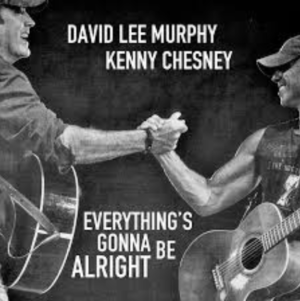 Word came out a couple years ago that David Lee Murphy and Kenny Chesney had been working on some music together. And it wasn’t about songs for a new Kenny album. It was an entire new album for David Lee. That was big news, but it’s been quiet since the initial announcement and rumor. But now the first song is out. And it features Kenny on vocals. And it’s been one of the most added songs at radio the last week or so. I have a really good feeling about this one. I think it’s going to shock the country world in 2018 and hit #1 on the charts. It should work its way up there sometime in early 2018 and not a ton of new music comes out then so there’s a good chance. The song is also something the world can use right now. Just a simple reminder that no matter how bad things seem it’s almost always going to be alright. Think back to the last few times you thought the world was ending… Do those events seem that bad now? This song is grooving. It’s definitely got the Kenny vibe. You can tell that he had a hand in making this one. But the ties for these two goes well beyond that. In case you don’t remember, David Lee had major hits in 1995 and 1996. Then he kind of had his first comeback in 2004 with a top five single. In the time since then he’s been one of Nashville’s most successful songwriters including co-writing several hits for Kenny. This is a good song. I think people are going to love it.